The pipe cleaners have been shaped into bodies and silk clay eyes, beaks and noses etc. have been attached. The animals have been fixed onto a stand made from foam rubber. 1. 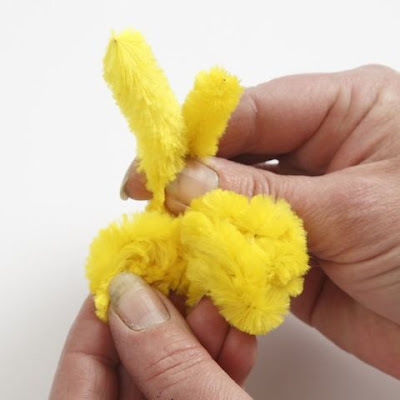 Crumple up and squeeze together a pipe cleaner. You may let legs and ears stick out. 2. Roll small white and black silk clay balls for eyes. The white ones should be larger than the black ones. Also roll or shape a beak or a nose and attach these parts onto the pipe cleaner animal without using glue. Silk clay has the consistency which makes this possible, before drying. 3. If you wish to use these Easter animals as a decoration for hanging, then attach a piece of elastic beading cord or a piece of string onto the heads. If they are to be used for standing, form a small ball from silk clay and attach this between the pipe cleaner and a cut-out foam rubber circle or stand.